woodCAD|CAM users” in Dallas, TX earlier this month. 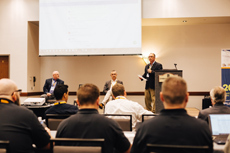 LAMAR, MISSOURI – December 4, 2017 – On November 14 and 15, RSA Solutions hosted Forefront, the first annual woodCAD|CAM users conference. 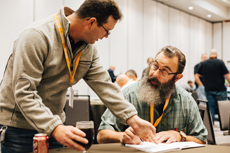 Software users from across the country attended the conference to learn about the new updated features in woodCAD|CAM 2018 and Cut Rite 10.0. 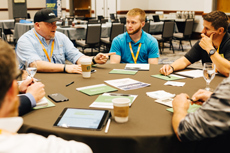 Forefront gave attendees an opportunity to network and have one-on-one time speaking with software developers, while learning the latest best practices for woodworking technology. 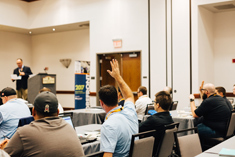 Attendees were excited to learn about and discuss upcoming software feature upgrades, including Cut Rite’s new Stay Down Tooling for Nested Base Applications, and woodCAD|CAM‘s Clash Detection, Parametric Drawing Annotation, and visually stunning woodPlan. For more information on Forefront, as well as woodCAD|CAM and other software solutions, visit RSA’s website at www.rsasolutions.us. A PDF version of this Press Release is available here. About RSA Solutions: Founded in 1999, RSA Solutions, formerly known as Roger Shaw & Associates, has built a solid reputation for being the largest independent sales and marketing company in the woodworking industry. RSA Solutions has assembled world-class suppliers that are focused on their specific area of expertise. We take the "Big Picture Approach" as we assemble focused technology from all over the world to achieve the most efficient process known in the woodworking community. Not a single source of incomplete solutions, but a single source of top-shelf, well thought out solutions that are task specific.